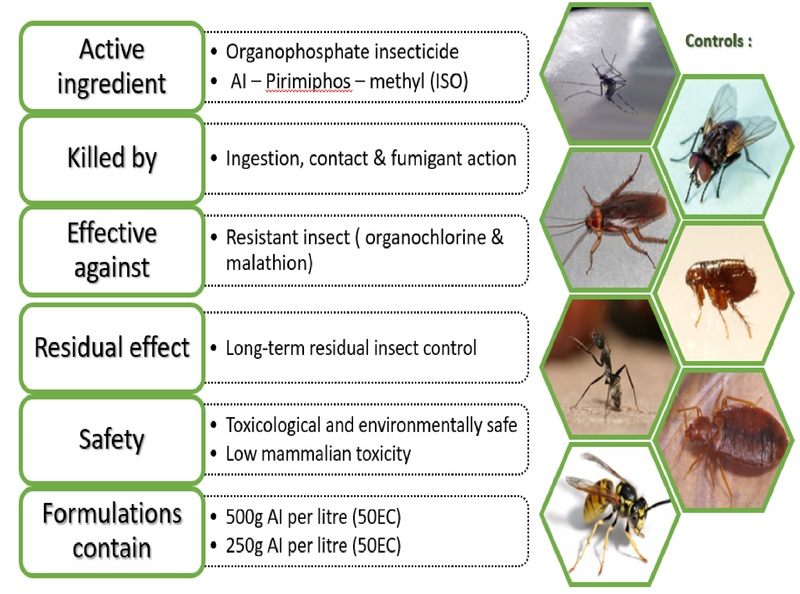 ACTELLIC is an organophosphate insecticide which controls a wide range of public health pests, including mosquitoes, flies, cockroaches, fleas, ants and other crawing insects. Insects are killed by contact, ingestion and fumigant action. It is equalily effective on those insects resistant to prganochlorine and some organophosphate chemicals such as malathion. ACTELLIC has a low mammalian toxicity and can be used for the disinfestation of domestic premises, industrial and catering establishments, food store and education establishments. When used in buildings and domestic premises, ACTELLIC persists on walls, floors, and other inert surfaces to give long-term residual insect control. ACTELLIC can also be used to disinfect beaches, refuse tips and new or seasoned timber. ACTELLIC is available as easy-to-use, emulsifiable concentrate formulations containing either 500g ai per litre (50EC) or 250g ai per litre (25 EC). ACTELLIC has a excellent toxicological and environmental safety profile. The information presented demonstrates that ACTELLIC presents no significant risk to human, other organism or to the environment when used as directed.